When studying the behavior of any animal in its natural habitat or enclosure, a stationary observation system offers a practical set-up. The Observer® XT based labs with a desktop or laptop computer, and one or more cameras, creates a perfect solution for situations like these. It can be used when studying animals in any situation: in a zoo or in the wild, farm animals in a paddock or stables, companion animals in their home, and so on. TrackLab is the integrated solution for the recognition and analysis of the spatial behavior of livestock. It is used to gain insights into multiple animals’ spatial behavior and social dynamics. Noldus and Ubisense have teamed up to achieve the end-to-end solution for real time and offline movement analysis based on Ultra-Wideband tracking (UWB). UWB tracking is the indoor locating solution that will aid you in your research on livestock behavior. A stationary set-up offers a practical solution when studying animals in their zoo enclosure , in a barn, or natural habitat. Your tracking data needs to be accurate even when you cannot see the animals. TrackLab can help you with this. A tracking solution with high-quality hardware for the acquisition of data and state-of-the-art software for the visualization and analysis of the tracks, TrackLab will make your spatial behavior research easier and more efficient. With a wide variety of ways to view your data and a variety of tracking technologies that can be used with it, TrackLab is the solution for your spatial behavior and movement studies. With the Observer XT you can score behaviors live or offline, or even combine both. This way, you can adapt your method to your research circumstances. When investigating the behavior of wildlife, live scoring will make sure you don’t miss anything important that is not caught on camera. 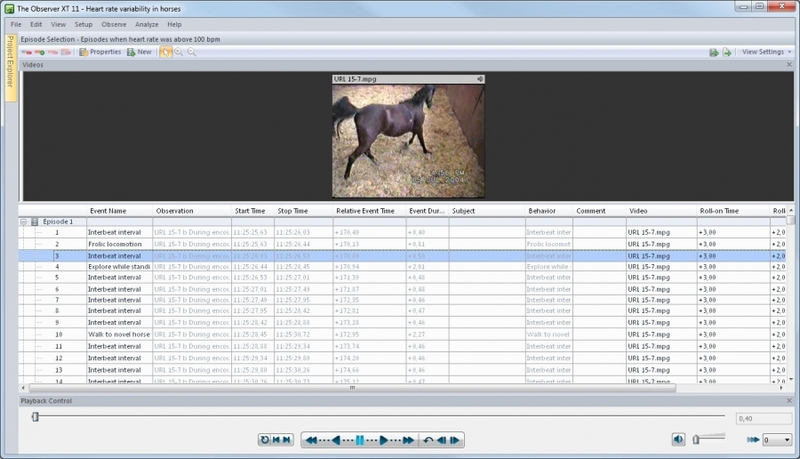 Scoring from video files has other advantages; you are able to fast forward through parts of the video in which very little action occurs (while animals are asleep, for example), making your research more efficient. Using video in your research, you can make sure you don't miss a thing. It allows you to score in great detail as you can adjust the speed of playback, and you can always go back to check and change things. 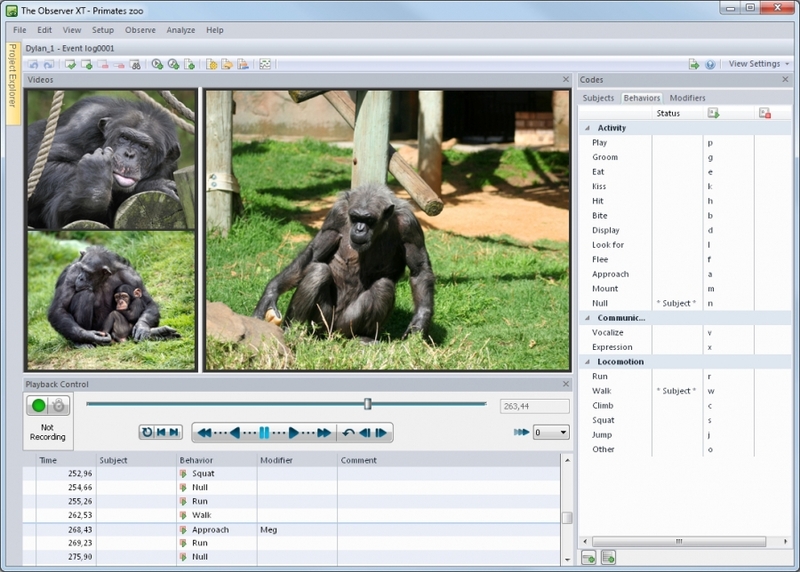 Another benefit of using video files is that you are able to replay certain parts at a slower speed; practical in situations where many behaviors occur at the same time and you want to score a behavioral pattern in great detail, or when you are observing multiple animals. To get the best of both offline and live scoring – connect one or more cameras to your computer, score live, and let The Observer XT acquire a video file at the same time. With a video feed of up to four cameras, you can look at the behavior from different perspectives, or observe a large area. This way, you really won’t miss a thing! One of the first essential steps in your research is creating a coding scheme (ethogram). You can define any subject you want to observe and every behavior you are interested in. The Observer XT helps you keep it clear and organized. And after you’ve started your observations, you’ll still be able to add behaviors to your coding scheme at any point. The Observer XT helps you keep your ethogram clear and organized. The Observer XT supports both continuous and instantaneous (time) sampling. Sometimes, combining both methods is just what your research needs. You can focus on one of the group members and score its behavior continuously, while generally monitoring the other group members, scoring their behaviors at set intervals. To work with multiple observers in one project, use our cost-effective Coder Licenses to create a multiple coder station configuration. It is ideal for easing the workload in large projects, or to give students hands-on experience with behavioral research. And with advanced analysis, you can perform reliability analysis to help you exclude observer bias. Many studies investigate correlations between location, physiological responses (such as respiratory responses heart rate, blood pressure, or body temperature), and specific behaviors. The Observer XT has several options for integrating and synchronizing signals from several data acquisition systems such as TrackLab, and even select and analyze them in combination with your behavioral observations. This allows you to investigate what a cow did while its heart rate was above a certain level, the influence of the presence of people in the stables on animal behavior, location, and physiology, and many more research questions. Find out more at the Behavioral Research Blog: read posts on animal welfare, and animal-human interaction studies, for example.